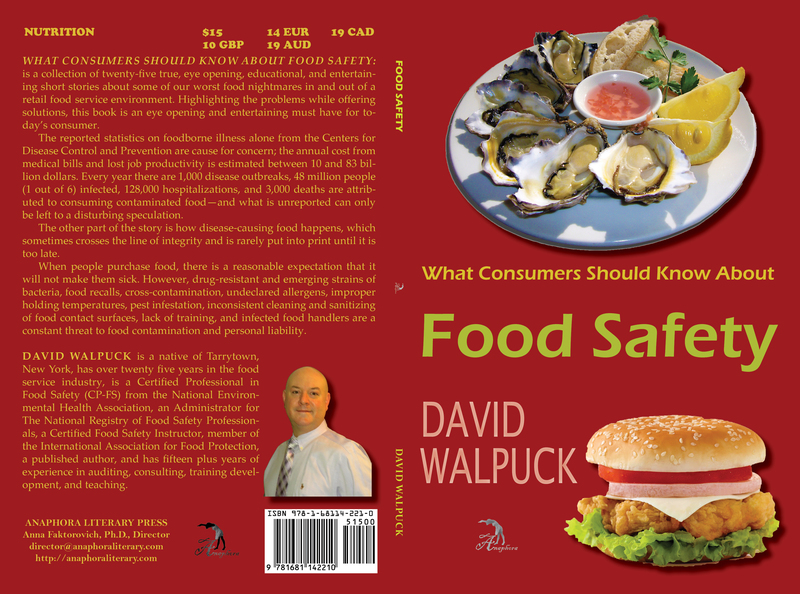 What Consumers Should Know About Food Safety: ($15, 94pp, 6X9”, Print ISBN-13: 978-1-68114-221-0, $30: Hardcover ISBN 978-1-68114-262-3, $2.99: EBook ISBN-13: 978-1-68114-222-7, LCCN: 2015955497, 20 illustrations, May 2, 2016; Purchase on Amazon, Google Books or Barnes & Noble): is a collection of twenty-five true, eye opening, educational, and entertaining short stories about some of our worst food nightmares in and out of a retail food service environment. Highlighting the problems while offering solutions, this book is a must read for today’s consumer. The reported statistics on foodborne illness alone from the Centers for Disease Control and Prevention are cause for concern; the annual cost from medical bills and lost job productivity is estimated between 10 and 83 billion dollars. Every year there are 1,000 disease outbreaks, 48 million people (1 out of 6) infected, 128,000 hospitalizations, and 3,000 deaths are attributed to consuming contaminated food—and what is unreported can only be left to a disturbing speculation. The other part of the story is how disease-causing food happens, which sometimes crosses the line of integrity and is rarely put into print until it is too late. When people purchase food, there is a reasonable expectation that it will not make them sick. However, drug-resistant and emerging strains of bacteria, food recalls, cross-contamination, undeclared allergens, improper holding temperatures, pest infestation, inconsistent cleaning and sanitizing of food contact surfaces, lack of training, and infected food handlers are a constant threat to food contamination and personal liability.